The linear steel kitchen impresses with its clear design language and classic styling. Exciting planning details and its unique appearance make this kitchen a one-off. Forster highlights the front colour, sapphire, and convinces with original design elements. Made of rough, authentic concrete, the worktop contrasts with the elegant, deep colour of the cabinets. Forster specifically uses this sober material in combination with playful and warm elements to underscore the elegance of the sapphire blue colour. With the golden profile handles and the matching fitting, an absolute highlight is created in the kitchen. The flattering colour of the handles harmonises perfectly with the sapphire blue fronts and the cool concrete. The fresh and gentle colour shade is both unusual and glamorous at the same time. 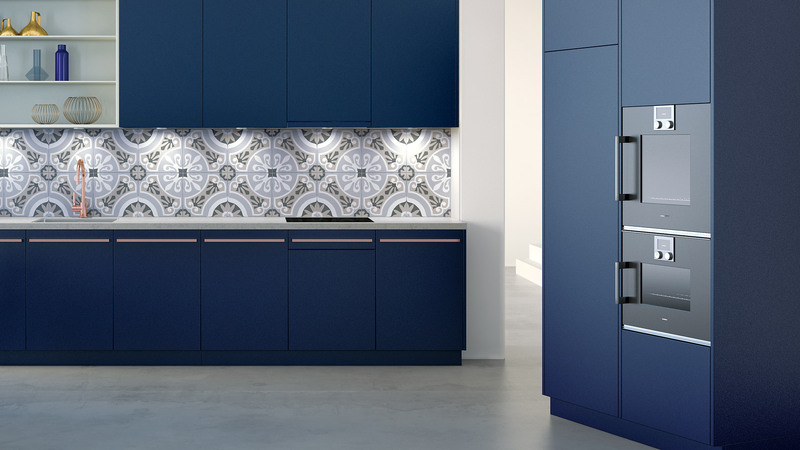 The folklore-style tiles used as the rear panel of the kitchen ensure a touch of nostalgia and stand out from the otherwise modern kitchen concept. Following recent growth in demand for craftsmanship, historical motifs are undergoing a revival in interior design. As a traditional brand, Forster effortlessly implements this trend to create a flowing combination of tradition and modernity. The open elements, consisting of slender steel shelves, consciously relax the formal arrangement of the individual elements. Thanks to the use of steel material, Forster shelves are only eight millimetres thick and can measure up to 1.80 metres in length. The delicate lightness that arises as a result is what makes a Forster kitchen unique.